After a rigorous review of dozens of applications from all over the world, we’re excited to announce the research groups who will receive supercomputing power, weather data, and cloud storage from IBM to accelerate climate change science. As our planet faces the mounting impacts of climate change, scientists are on the front lines of understanding complex consequences and developing solutions. We’ve heard from climate change scientists that common bottlenecks they face include limited access to weather data, and insufficient computing power and data storage capacity to accurately simulate the impacts of climate change. As our planet faces the mounting impacts of climate change, scientists are on the front lines of understanding complex consequences and developing solutions. Common bottlenecks facing scientists conducting foundational research include limited access to weather data, and insufficient computing power and data storage capacity to accurately simulate the impacts of climate change. To build on IBM’s decades-long commitment to environmental stewardship, IBM Corporate Citizenship is helping overcome these roadblocks by donating technology and data to three foundational climate change research projects. These IBM resources–crowdsourced computing power through World Community Grid, weather data from The Weather Company, and IBM Cloud Object Storage–will support three groundbreaking new research projects, chosen from over 70 applications for their potential to make a significant contribution to our understanding of climate change impacts and potential solutions. This project will examine the impact of climate change on temperature and air pollution at local levels, helping researchers understand the impact of a changing climate on human health. Atmospheric aerosols, such as dust, smoke and pollution, both absorb and reflect sunlight in the atmosphere, and represent the greatest area of uncertainty in climate science today, according to the UN Intergovernmental Panel on Climate Change (IPCC). This project aims to determine how super-micron particles (6 to 12 micrometers in diameter) interact with sunlight and how they contribute to atmospheric temperatures – information that will improve the accuracy of climate models. In Africa, agriculture relies heavily on localized rainfall, which is difficult to predict. In collaboration with the Trans-African Hydro-Meteorological Observatory, researchers will simulate rainfall on the continent – information that could help farmers be more resilient, among other weather and hydrology applications. In return for this support, the winning scientists agree to publicly release the data from their collaboration with IBM, enabling the global community to benefit from and build upon their findings. 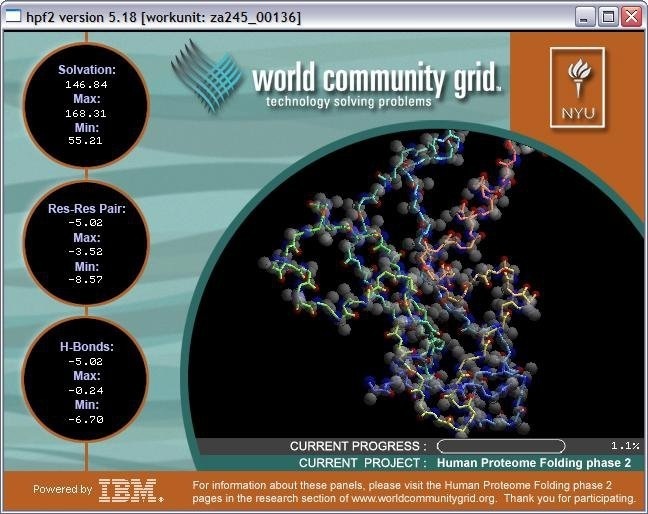 Scientists receive free, 24/7 access to computing power through World Community Grid, a philanthropic initiative of IBM that enables anyone with a computer or Android device to support scientific research by carrying out virtual research experiments on their devices. Through the contributions of over 740,000 individuals and 440 organizations, the initiative has enabled a number of breakthrough discoveries in environmental research by helping scientists discover new materials for efficient solar energy, study the impact of management policies on large watershed areas and uncover more efficient ways to filter water. The historical and real-time weather data of The Weather Company, an IBM business, can help scientists advance our understanding of environmental systems and support the design of solutions to prevent, mitigate against, and adapt to climate change. For scientists who work on environmental research initiatives with very large data sets, IBM Cloud Object Storage provides a scalable platform to store and analyze the results of virtual experiments on World Community Grid and conduct further investigations. We’re a philanthropic initiative of IBM that connects researchers with free and massive computing power, donated by volunteers around the world, to advance scientific research on our planet’s most pressing issues. Anyone with a computer or Android device can sign up to participate. To date, over 740,000 individuals and 430 organizations have contributed over a billion years of computing power to support 29 research projects, including studies about low-cost water filtration systems and new materials for capturing solar energy efficiently. Our research partners have published over 50 peer-reviewed scientific papers in journals including Science, Nature and PLOS. This crowdsourced computing power, which is provided to researchers for free, often allows them to take on research efforts at an unprecedented scale, pursue new research approaches and get the work done in years instead of decades. How does World Community Grid work? Scientists from institutions all over the world come to us with research projects that need massive amounts of computing power. 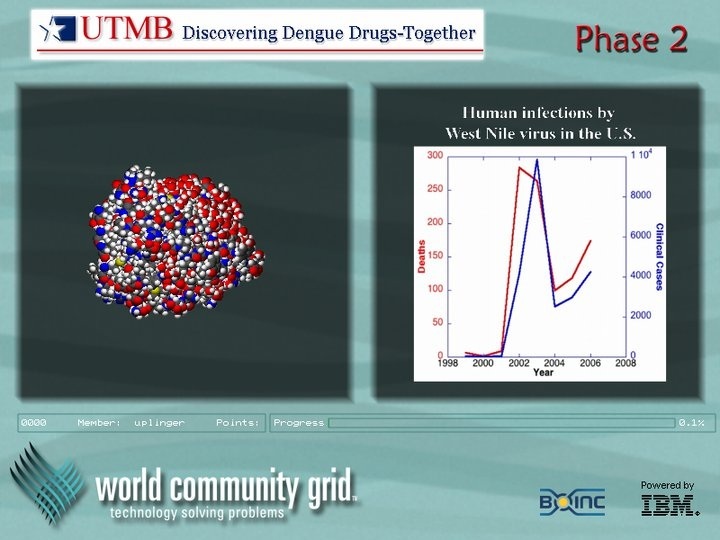 Using their research simulation or modeling software tool of choice, we integrate that software into our platform and distribute millions of virtual research experiments to thousands of World Community Grid volunteers, who perform these calculations on their computers and Android devices. World Community Grid validates and bundles the results of these calculations and sends them back to the researchers. 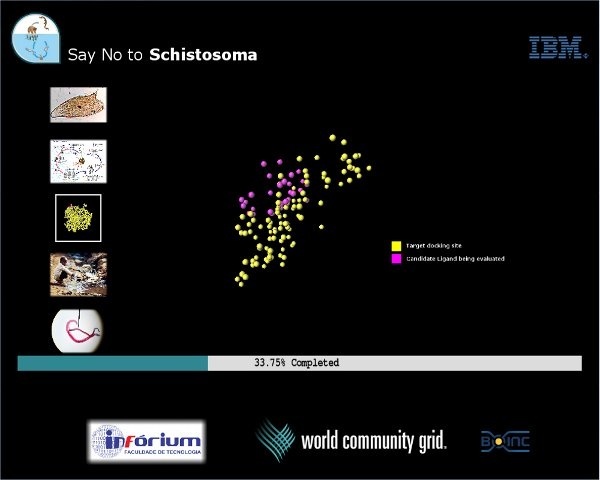 Through World Community Grid, scientists can not only access massive computing power at no cost, but can also engage the public in their research. What climate and environmental research has World Community Grid supported to date? 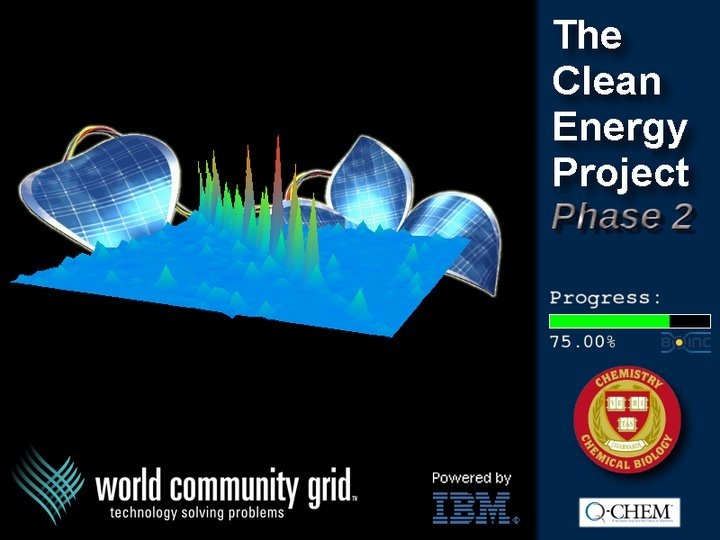 Clean Energy Project – In what is believed to be the largest quantum chemistry experiment ever performed, researchers at Harvard University screened millions of organic photovoltaic compounds to predict their potential for converting sunlight into electricity. Amongst these, 36,000 were predicted to double the efficiency of most carbon-based solar cells currently in production. 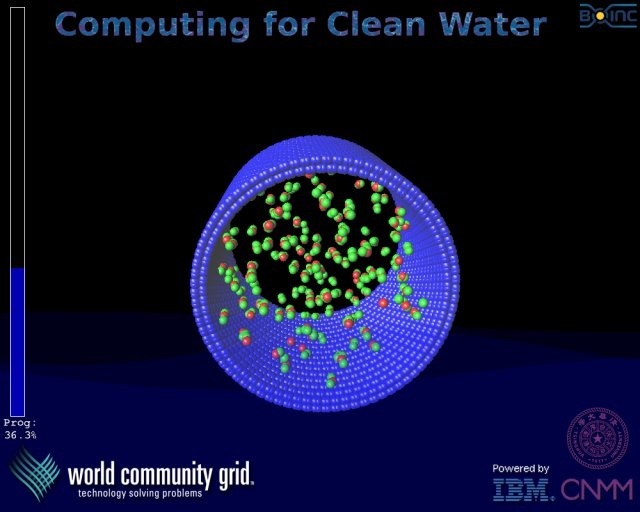 Computing for Clean Water – Researchers at Tsinghua University in Beijing used World Community Grid to simulate the flow of water through carbon nanotubes at an unprecedented level of detail. In doing so, they discovered a phenomenon that points to a new possibility for water filtration which could one day improve access to clean water for the nearly one billion people around the world who lack access to it. Computing for Sustainable Water – Scientists at University of Virginia studied the impact of management policies on water quality in the Chesapeake Bay to gain deeper insights into what actions can lead to restoration, health and sustainability of this important water resource. Uncovering Genome Mysteries – Researchers examined 200 million genes from a wide variety of life forms, such as microorganisms found on seaweed from Australian coastlines and in the Amazon river. The goal of their work is to augment knowledge about biochemical processes in general, identify how organisms interact with each other and the environment, and document the current baseline microbial diversity, allowing a better understanding of how microorganisms change under environmental stresses, such as climate change. What kind of computing power is being made available with the grant? Scientists who receive these awards will use World Community Grid, a philanthropic IBM initiative that provides scientists with massive amounts of computing power, for free. 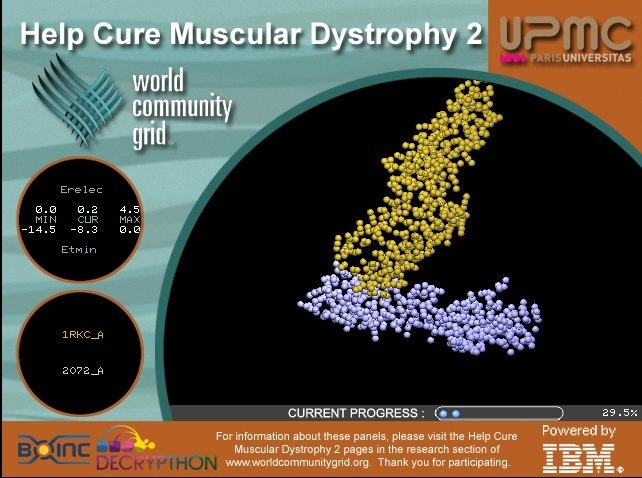 Through World Community Grid, computational research calculations are distributed to thousands of volunteers around the world who perform these calculations on their computer or Android devices. In addition, we carry out the technical work to integrate the researchers’ computational research tool of choice into the World Community Grid platform. 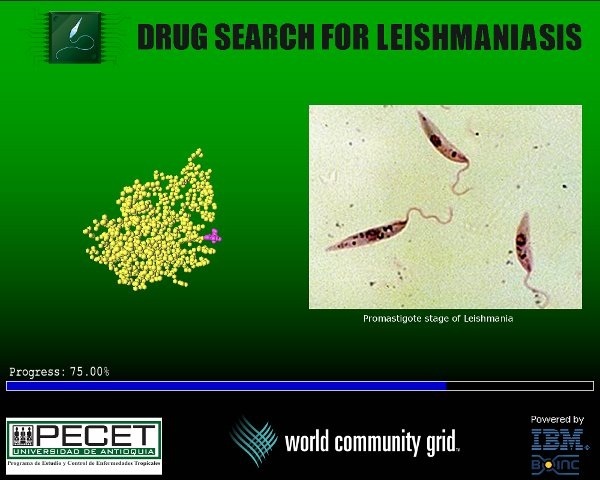 We also provide communications and outreach support to engage and educate the public in this research. How is the computing power being made available by World Community Grid different from a supercomputer? As one of the researchers who has used World Community Grid for several years once said, “It turns out that having hundreds of thousands of computers in parallel accelerates things more than having a supercomputer.” World Community Grid provides scientists with 24/7 access to enough computing power to match some of the world’s most powerful supercomputers. But unlike a traditional supercomputer, World Community Grid distributes the computational work to thousands of computers worldwide, each of which is provided by a volunteer who chooses to make their device available to conduct scientific calculations. For our research partners, this means not having to wait in line for computing resources as they would with most supercomputers at their own institutions. Instead, they receive free access to massive amounts of computing power, while engaging the public in their research. What weather data is being made available to grant recipients? Grant recipients have free access to weather data from The Weather Company, an IBM business, to support their research. The data may include global weather forecasts, historical observations, and current weather conditions. Access to the data will be provided through web-based APIs, while the project runs on World Community Grid. What cloud storage capabilities are being made available to grantees? Grant recipients have free access to IBM Cloud Object Storage for all data storage needs related to their IBM-supported project, while the project runs on World Community Grid. Technical assistance will also be provided to assess their data storage needs and determine appropriate storage solutions. What were the criteria for successful proposals? Tackle climate change: Advance understanding of the impacts of climate change, and/or strategies to adapt to or mitigate the impacts of climate change. Contribute to open science: all data generated by World Community Grid volunteers must be made freely available to the scientific community. Enabled, accelerated or enhanced by the resources we offer: climate or environmental computational studies that require significant computer processing power and can be divided into small independent computations, may need weather data, and/or could benefit from large amounts of cloud-based storage. What commitment do scientists make in return? In return for these free resources, scientists agree to support our open data policy by publicly releasing the research data from their World Community Grid project, to enable the global scientific community to benefit from and build upon their findings. Research teams also agree to engage the volunteers in their research through regular communications through World Community Grid communication channels. When will these projects begin running on World Community Grid? We have begun the onboarding process for the projects, and are planning to launch the first project later in 2018. We will be posting updates about this process on our website. Can researchers still apply for these resources? We’re not currently accepting applications that include data from The Weather Company and storage from IBM Cloud, but any researchers who are interested in using World Community Grid’s computing power are welcome to submit an application. How do I make sure that I start contributing to these projects as soon as they’re launched? If you are already a World Community Grid volunteer, go to the My Projects page, where you can choose to opt in to new projects as they become available. If you’re not yet a World Community Grid volunteer, you can sign up to be notified as soon as the first of these three projects is launched. You can also join World Community Grid right now and support our existing projects.